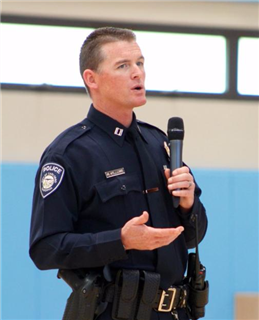 During an all-school Community Life presentation on Thursday, March 31st, Carlsbad Police Department Captain Mickey Williams discussed the department's body-worn camera pilot program. Capt. Williams gave a brief presentation on the technology's functions, cost, advantages and disadvantages. The department's hopes, he said, are that the cameras will enhance trust, evidence collection and public safety. Following the presentation, students and faculty had the opportunity to ask thought-provoking questions about the program's data safety, constitutionality, and complex privacy issues.